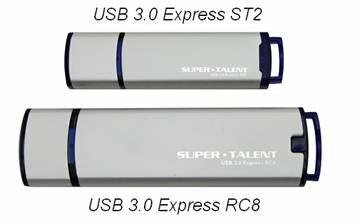 Super Talent presents the USB 3.0 Express ST2, a new dual-channel USB 3.0 flash drive that promises price points comparable to USB 2.0. Super Talent Technology, a leading manufacturer of flash storage solutions and DRAM memory modules, today announced the USB 3.0 Express ST2, a new dual channel USB 3.0 flash that hits price points comparable to USB 2.0. As USB 3.0 begins to proliferate through the market, customers are anxious to utilize the new capabilities of these machines and get a taste of what USB 3.0 has to offer. Many are simply looking to hit speed here to fore impossible on the USB 2.0 bus, without breaking the bank. For those customers, the ST2 is perfect. Fully backward compatible to USB 2.0, the ST2 is future proof, offering excellent performance on bus the USB 2.0 or 3.0 bus. Offering similar performance as our USB 3.0 Express DUO (67MB/s read, 24MB/s write), the ST2 now gives our customers a choice in case design. Based on our popular design recently debuted with the Express RC8, the ST2 is enclosed in a sleek aluminum housing and accented by a translucent blue plastic trim. The design characteristics offer both feature parity and a strong family resemblance. Just like the RC8, the translucent plastic features on the ST2 serve as both a means to retain the cap and it acts as a light pipe for the enclosed blue LED; even straight through the cap. Available in 8GB, 16GB and 32GB capacities, the new USB 3.0 Express ST2 is NOW IN STOCK and ready for immediate shipment. MSRP for the 8GB ST2 is $20 USD. Measuring 70 x 18 x 8 mm, the new USB 3.0 Express ST2 is as small as many USB 2.0 flash drives and won’t block adjacent ports.